Free Cake a photo by shaunadieter on Flickr. Saturday was the Shimek carnival. I went and helped decorate in the morning. 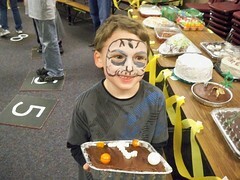 Max did the cake walk first and won a cake on the first try! He picked this one because of the marshmellows. There was lots of games and prizes, but the best was the bouncy house. Max loved it. Great face paint! Like the cake too!